Home Numerology Angel Number Meanings Quadruple Digit Angel Numbers Meanings Angel Number 4444 Meanings – Why Are You Seeing 4444? Is it all just coincidence, or serendipity? You pop to the shops on a Saturday afternoon to get some ingredients for tonight’s dinner. Your final bill comes to $44.44. As you are working away in the kitchen, one of your guests calls from a new number, which you notice end in 4444. When they finally arrive, they bring you a bottle of wine, and you notice that the barcode includes the digits 4444. Why are these 4s showing up everywhere you look? Could Angels be sending them to you to tell you something important? What could the quadruple digit Angel Number 4444 be trying to tell you? What does Angel Number 4444 mean for love? Whenever you see 4s, you can be pretty sure that the message they hold has something to do with the foundations on which you have built your life. The number 4 is all about foundations and roots, and quadrupled to 4444, this meaning is amplified. Look at your work and home, family and friends, values and beliefs. Angel Number 4444 is also connected with the number 7 as 4+4+4+4=16, which further reduces to 1+6=7. The number 7 is linked with the spiritual and the esoteric, the hidden knowledge that is not always easy to understand, and also the path to new knowledge. Angel Number 4444 calls us to pay attention to our foundations. Perhaps they are cracking, perhaps our actions are threatening them, or perhaps new knowledge means that old foundations need replacing. Sometimes we are asked to do something that we know is wrong, but we think it might be OK this time. Perhaps we are asked to tell a lie in order to avoid group shame and punishment. Maybe we are asked to bend the rules in order to get something finished. While most rules are simply guidelines that can be broken under the right circumstances, your moral compass should never be treated as flexible. Angel Number 4444 can appear when you are in a position where you are considering doing something that conflicts with your morals. It asks you whether the pay off is truly worth diminishing that part of yourself. We all have big dreams and big ambitions, and we want to get to our imagined end point as fast as we can. However, when we cut corners and skip important steps in the process, when we reach our destination, we can often find ourselves slipping, or even crashing, backwards, because we lack something in our foundations to hold us in place. Angel Number 4444 often suggests that we need to be patient. We need to put the hard work into building solid foundations in order to succeed. A 100m sprint takes 10 seconds to run, but years of training to complete. Sometimes we reject ideas because ‘that is not the type of thing we do’. But why? What is the founding principle that makes this idea ‘not us’? If we are tempted by an idea, it must have some merit, otherwise it would not stick in our mind. Definitions of ourselves help us understand who we are and steer a course that accords with our values. But none of us stays the same for our whole lives. We evolve, and our belief system needs to evolve with us. Angel Number 4444 can show up when an idea that we have rejected is gnawing at us. It asks us to consider whether it is our belief system that needs updating. It is easy to see the value of investing in a house or a car, they have tangible utility and value. Sometimes it is more difficult to see the benefit of spending the time and money to invest in ourselves. It is self-indulgent to go back to school and learn something completely new. It feels too risky to take three weeks off from work for that dream holiday. Paying for that gym membership to help get our health back on track is too expensive. 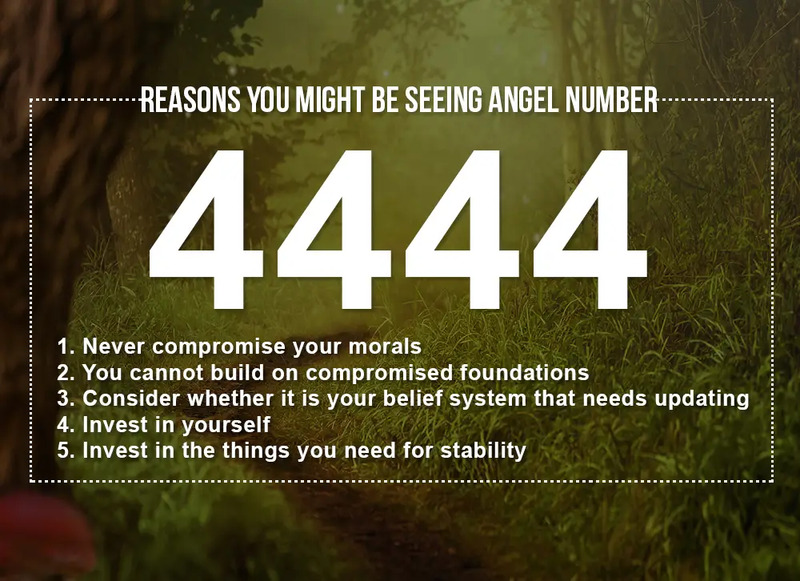 The 4444 Angel Number can appear to remind you that while everything else in your life is transient, you are consistent. In some ways, you are all you have. Therefore, investing in yourself is the most important thing you can do. Do not let fear, doubt or shame stop you from being the best version of yourself that you can be. We often criticise modern society as being overly materialistic, and it is certainly true that many of us have much more than we need and strive for ‘things’ that will never bring us real joy. On the other hand, there is a level of material security that gives us the stability that we need to thrive. When we know that we have a roof over our head, where our next pay check is coming from, and that we can provide for our loved ones, we have more confidence to take risks and become more than we are. Angel Number 4444 can appear to remind us that it is not wrong to want material stability, and that we should invest in our own comfort and security. When it comes to love, Angel Number 4444 can often be shown to us as a reminder that shared beliefs and desires form the foundation of any strong relationship. While these things do not need to be identical, there needs to be affinity between what you and your partner want, and what you both believe is right, or you will soon find yourselves butting heads. If the gulf between you is too great, you may never find a compromise. While you might never be able to agree on what film to watch, make sure that you can find common ground where it really matters. Whenever you see an Angel Number, the first thing to do is take a few minutes to show gratitude. Regardless of the individual message, seeing an Angel Number means that the Angels are with you and supporting you, and that you are open to their help. 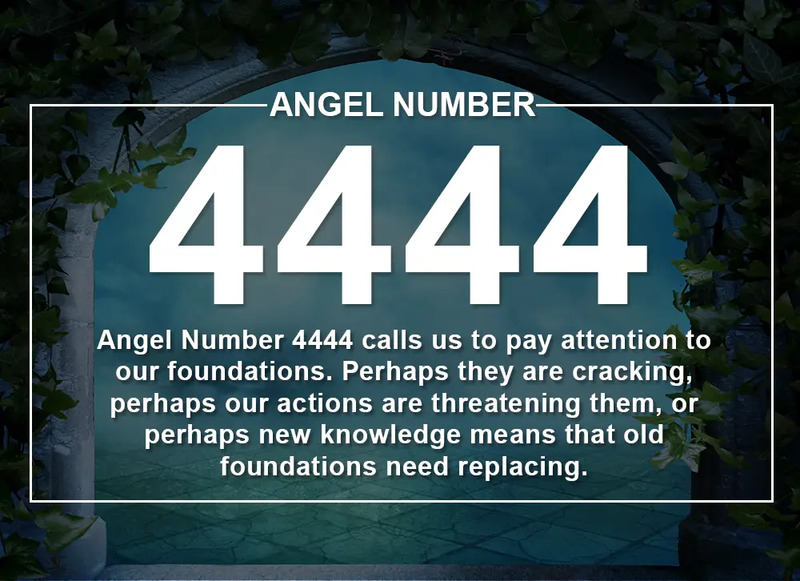 In order to determine the specific message that Angel Number 4444 might have for you, pay close attention to what you were doing or thinking when the number appeared. Angels will nudge us to notice numbers in moments of significance, giving us the clues that we need to decipher their meaning. Do you seek guidance and insights into the past, present and future, with regards to relationships, love, or money? If you are frequently seeing the 4444 Angel Number, take this popular free test to see whether your Guardian Angel is trying to send you an urgent message. Keep seeing 4444 everywhere? What could Angel Number 4444 be trying to tell you? This number calls us to pay attention to our foundations. Learn more here!